1) When does this actually happen? 28 July 2015, is my entry in the betting pool. 2) How long does the problem last? 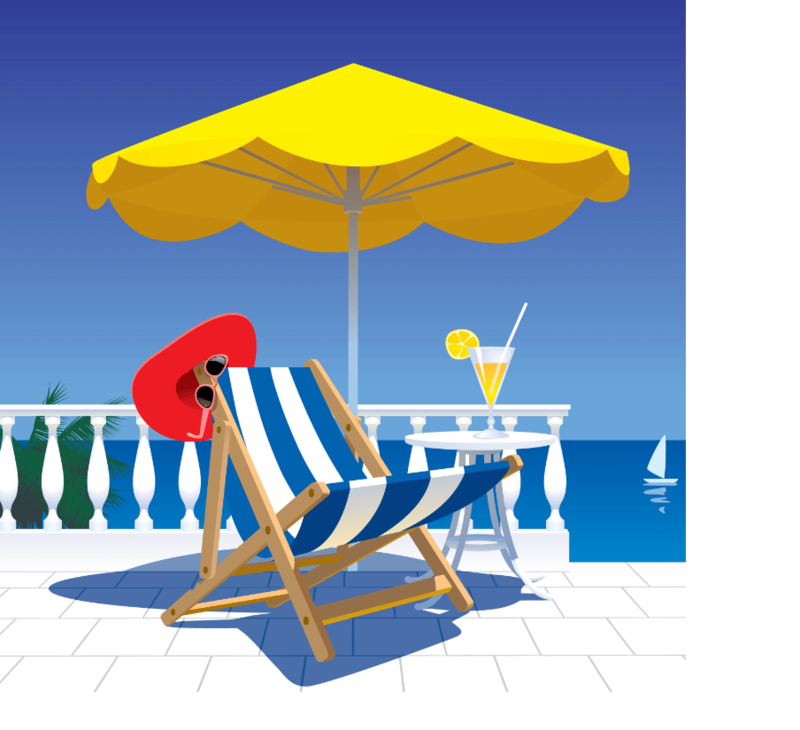 1 October 2015, making for a long, hot, and miserable summer. 3) Why do we have this problem? SBA didn’t recognize the issue and Congress won’t act till the problem is a crisis. Over next few days, we will look at each of the three questions posed and the responses. Hopefully, this will assist you in formulating a response to the situation as regards both your borrowers and your management. When does this actually happen? If you a betting man, 28 July 2015. Why? In the larger sense, loan demand from a recovering economy, in combination with bank capital requirements, is driving higher program utilization higher and doing so at a faster marginal rate than was estimated. The specific mechanics are discussed below. 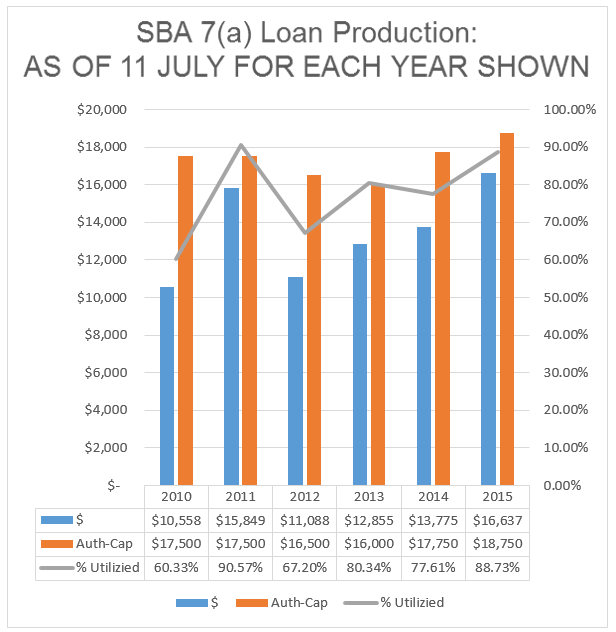 The chart shows the growth of lending since FY2012, through 11 July, the most current figures available on the SBA website. (www.sba.gov, go to “About SBA” tab, “Newsroom”, “Weekly Lending Report”) While the program authority cap has also increased, the volume of lending has also grown and has done so at an accelerated marginal rate in the past year. As of mid-last week, remaining program authorization was stated to be some $1.75B, implying daily approvals of new SBA loans during the period between the chart data and then of some $120MM, a rate consistent with the $100MM to $115M for the two preceding months, but well above rates earlier in the year. This implies approximately twenty-odd days of 7(a) lending remaining, taking us into early August. The fallacy in that logic is to assume a constant rate of loan approvals, and that cancellations, which have been running at about six percent (6%) of approved volume, will also run at consistent rate. It may be constructive to look at a similar situation and see what can be extrapolated. The late summer of 2013 was similarly faced with the possibility of a shutdown of the 7(a) program, in that instance driven by the possible shutdown of the Federal Government. As the table above shows, the grew at double digit rates through the Summer of 2013, culminating in a massive jump in September 2013. In drawing extrapolations from these numbers, several factors need to be remembered. Firstly, that SBA itself co-operated at a fiscal year end in processing loans. SBA can decide to process loans at whatever pace, within reason, which they choose, thus artificially moving the goalposts. Secondly, is the simple fact that there are more participating lenders than there were in September 2013. Given the increases in volumes, it is also logical to assume that many of these lenders have become more efficient in the intervening two years to handle the growing volume of loans. These factors, on the whole argue, for a comparable, if not larger jump in approvals and a very aggressive effort to cancel “dead” authorizations, through the end of July. possibly as early as the 28th of July 2015, we hit the cap.